Home > Organizing Tips > Get Organized > Get Started Organizing a Space You’ll Love! 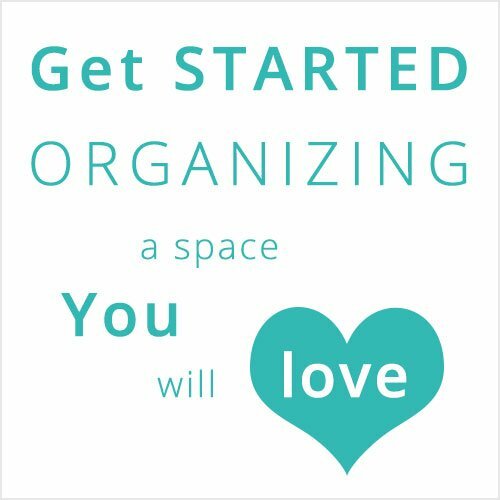 Get Started Organizing a Space You’ll Love! Many people email or call me because they know they want to get more organized, but they don’t know where to start. They’re feeling overwhelmed and don’t have a clear plan for where and how to begin. Here are some ideas to break through that “stuck” feeling and get started organizing and create an organized home you’ll love. Step 1: Define your end result. What’s bugging you about the space? Are there things in the room that don’t belong? When you’re done, how will the space look? When you’re done, how will the space feel? When you’re done, how will the space function? Step 2: Create an action list. Once you have a list of all the things you’d like to do, pick one thing and start! If general decluttering is needed in many of the spaces on your list, this is a great place to begin. First, go on a scavenger hunt and find all the things you know you no longer use, need, or love. Grab a box (or two or three) and set a timer for fifteen minutes. See how much bulk you can eliminate before the buzzer dings. If this feels great, set the timer for another fifteen minutes and keep going. Or set a goal to do the buzzer exercise every day for fifteen minutes until all your “low-hanging fruit” is gone. Your goal for the scavenger hunt is to make quick and easy decisions to eliminate as many unneeded things as quickly as possible. Be sure to get these items completely out of your home. (Putting them in a box in a basement, garage, or other storage area in anticipation of a garage sale doesn’t count!) By getting these items out of your home, they’re completely off your radar screen. This will energize you to move on to the next phase of your project. Step 4: Concentrate on one space at a time. After the scavenger hunt phase, focus on one space at a time. Once you’ve decluttered each room, select containers you love that are appropriate for the items that will remain in the room. By waiting until late in the process—after decluttering and defining which items will go where—you can feel more confident in selecting containers that will work in your space and be worth your investment. Add labels to your containers so it’s easy to maintain your new organizing system. Step 5: Continue to make progress. From here it’s a matter of continuing to tackle one space at a time while maintaining order in the spaces you’ve already completed. Start by defining the end result. What do you want to keep, where do you want to keep it, and what will your rooms be like when you’re done? Then go through each space and do an initial sort and edit, without digging too deep. Basically, get rid of the surface clutter and move things to where they will ultimately live (especially if they will ultimately live away from your home). This will give you breathing room and motivation to do the deeper purging. Once you’ve done the deep purge and have things where you want them, buy your containers. There is definitely a bit of moving things from point A to point B in organizing. The key is to decide where you want point B to be before you start the process. This keeps you always moving in the direction of your desired end result. If you need help getting started, your timing couldn’t be better! Join my upcoming Organize-athon. I’d love to help you get started and create a home you love! You can read all of the details in this post. Aby, I want to let you know that I had put off my organizing for a long, long time. I had 4 children which I homeschooled and all my time went toward daily basic things such as making dinner. Not until a few years ago have I really jumped back into organizing my home again. Mainly because I knew it needed it, I needed it. I had found your blog and everything you said made sense to me to give me that big push to get me started. I have been conquering my tasks ever since. I am slow and of course you know about the maintance that needs to happen…laspse back into bad habits…then press on. Whether its 15 minutes a day or one box a week, eventually the load feels lighter. So I am saying THANK YOU today for the words of encouragement I needed to hear and the easy ideas that you’ve conveyed. Please know you and your team have touched my life in a positive way. Thank you so much for your comment Connie! I’m so glad that my ideas have had a positive impact on your life. I also really appreciate you letting me know. Hi, Aby! I’m at exactly this stage you’re addressing. As you know, I did the Organize-athon last week, and now I’m thrilled that all my clothes are in one closet instead of 3, that only the clothes I love and that fit are in there, and that they’re organized by color. It’s a beautiful and orderly spot in our house. There’s even room for the new clothes I’m sewing. Thanks to your advice, I went for a small project, so I could finish it in one weekend. Now I’m energized to keep going. There are too many projects that call to me, including the spring gardening. Last night, I told my husband I need to do a Simplify101 Brain Dump and get all these ideas to stop swirling around in my brain. And here you are today, with a nicely-laid out set of steps to follow. Step 2 starts with corraling those ideas. Step 3 will start tomorrow, when my young interior designer friend comes over for a consultation and to lay out our Action Plan for the summer. Thank you so much for being in sync with what my husband calls “My Hopes and Dreams”!